Let me start today by declaring that I LOVE CHRISTMAS. I am not ashamed to admit this fact. Everything about Christmas gets me excited. The decorations, the presents, the whole father Christmas thing, getting the family together. I love it all. 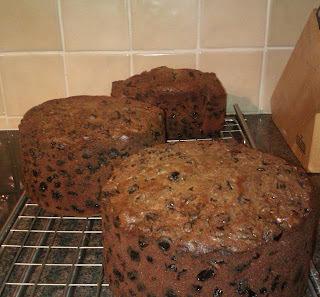 I also love fruit cake and anything made with dried fruit, really, so Christmas baking is my absolute favourite thing. Today is Christmas cake baking day. I always make my cakes in the last week of October. Why? Because Delia Smith says so. I am a huge fan of Delia Smith's Christmas cookery book and have had my copy for 15 years and use it every year for her Christmas cake recipe and her Christmas pudding recipe. I cannot imagine Christmas without Delia. She is a hero of mine along with Nigel Slater and Jamie Oliver. This, I suppose, brings me to my second declaration. I am a messy cook! Anyone who has had to clear up behind me will know that my mantra in the kitchen is why use one dish when you can use 10! I must add a little aside here; If it wasn't for my dishwasher and my fabulous husband I probably wouldn't bake quite as much for although I am a messy cook, I hate clearing up afterwards! My husband and I have an agreement. I cook, he cleans up after me. My friend calls him Dobby the house Elf . I prefer "my kitchen Richard, every house should have one!" Anyway moving on, because I am a messy cook and my favourite cookbooks are used with extreme regularity, some of my cookery books have taken on a 'scratch and sniff' quality. Delia's Christmas book being one of them. When I pick up the book it naturally falls open at the Christmas cake page and as I look at the page there are bits of dried cake mix and grease stains adorning the recipe, memories of Christmas's past come flooding back to me. Happy years and sad years but every year for the last 15 have included this cake making ritual. I generally make 3 or 4 Christmas cakes each year. One for our house, the rest are gifts for my sister and her family, for my friend who is a Christmas cake fan and for Gem my gluten free friend. Once fed, marzipaned and iced, my husband makes festive presentation boxes for the cakes. The picture today is of the fresh out of the oven cakes. It will be a while before I can photograph the finished boxed cakes. Rather than copy Delia's recipe out. below is the link to her recipe on the Delia online website. I make my cakes exactly as she says, my only tweak is I omit the almonds and replace with more dried fruit. I am not a fan of nuts in fruit cake. For Gem's gluten free version I use 2 tsp of Xantham gum and Doves gluten free self raising flour blend. I also have my own way of feeding the cakes. I feed them weekly with brandy via a syringe and needle. Usually 5ml a week injected into the cake in different spots each week. This method means the brandy gets to all parts of the cake and makes a really well brandied and moist cake.